'Our Wing Engaged' The Ops Room at RAF Kenley (1943) by Lilian R Buchanan RWA. 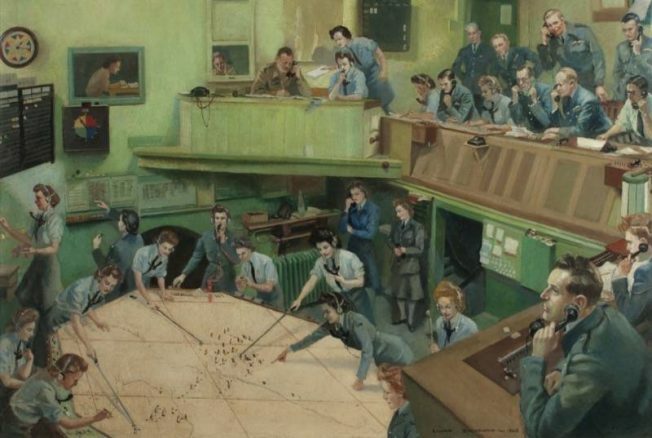 Before the Second World War, the Royal Air Force was organised into ‘Fighter’ and ‘Bomber’ Commands. Fighter Command was further split into Groups, of which the south-east was 11 Group. These Groups were divided into Sectors, each with a principal aerodrome. Kenley sector was responsible for protecting the capital from attacks. The leader of Fighter Command was Air Chief Marshal Sir Hugh Dowding. The stars of the show at the fighter stations were the pilots, but their successes depended on the teams of support staff, who operated at ground level. Radar (Radio Directional Finding) detected approaching aircraft out to sea, then the Observer Corps following them overland. This information was filtered and passed to the Operations Room, where the picture of the developing raid was plotted. The fighters were then scrambled and directed to intercept the enemy. Arthur Owens, an electrician living in Kingston, secretly passed on intelligence to the Germans about the existence of radar and the number of aircraft station at Kenley. Despite having this information, and much to British surprise, the radar stations were not often bombed. This was later found to be due to a German administrative error.